This study examines how students explain their conceptual understanding of protein function using visualizations. Thirteen upper secondary students, four tertiary students (studying chemical biology), and two experts were interviewed in semi-structured interviews. The interviews were structured around 2D illustrations of proteins and an animated representation of water transport through a channel in the cell membrane. In the analysis of the transcripts, a score, based on the SOLO-taxonomy, was given to each student to indicate the conceptual depth achieved in their explanations. The use of scientific terms and non-conventionalized expressions in the students’ explanations were investigated based upon a semiotic approach. The results indicated that there was a positive relationship between use of scientific terms and level of education. However, there was no correlation between students’ use of scientific terms and conceptual depth. In the interviews, we found that non-conventionalized expressions were used by several participants to express conceptual understanding and played a role in making sense of the visualizations of protein function. Interestingly, also the experts made use of non-conventionalized expressions. 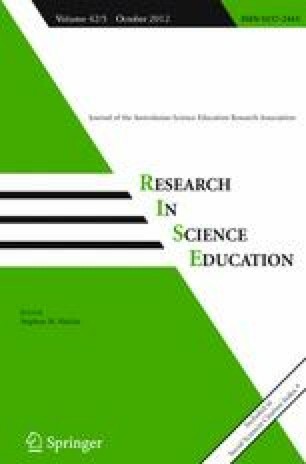 The results of our study imply that more attention should be drawn to students’ use of scientific and non-conventionalized terms in relation to their conceptual understanding. We would like to thank Martin Eriksson and Mari Stadig Degerman, who have made their diploma theses in this project. They have made a valuable contribution in the collection of data. This project has been sponsored by The Municipality of Norrköping, The Swedish Science Council (grant 2003-4275) and The Swedish National Graduate School in Science and Technology Education Research (FONTD). Visualization 1. Visualization of transport through the cell membrane. Designed by the first author and Martin Eriksson from various examples in text books. Visualization 2. Visualization of the process of protein synthesis. Redesigned from an original by Mix/Farber/King. Explaining the aim of the project and the interview procedure. Courses taken in natural science. Scientific background in the family. Interest for science—does it come from the school, from the family or from media? Visualization of the process of protein synthesis. Visualization of transport over the cell membrane. Animation of transport through water channels in the cell membrane. Learning technique—How do you use text/images/notes when studying for an examination? Possibility to change statements and to ask questions. Duit, R. (2008). Bibliography STCSE, Students’ and teachers’ conceptions and science education. IPN, Kiel: http://www.ipn.uni.-kiel.de/aktuell/stcse/stcse.html.